KANSAS CITY, Mo. 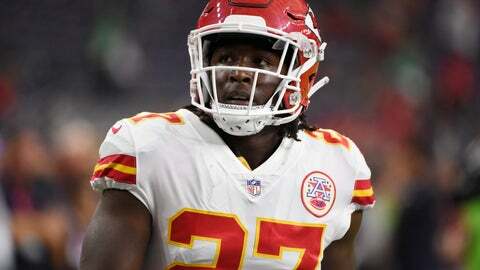 (AP) — The Kansas City Chiefs released running back Kareem Hunt on Friday night after video surfaced that showed the NFL’s reigning rushing champion knocking over and kicking a woman in a Cleveland hotel hallway in February. Hunt was at the Chiefs’ facility Friday in preparation for Sunday’s trip to Oakland, but he was excused and sent home shortly after TMZ posted the video online. It shows Hunt being restrained several times by friends before pushing a woman to the ground, where he proceeds to kick her. Police were called to the scene during the Feb. 10 incident, no charges were filed. The police did not respond to several requests for comment Friday night. The Chiefs and the NFL have been aware of Hunt’s incident since it occurred, but much like the case involving former Ravens running back Ray Rice, the video brought a new dimension to the case. It showed Hunt lunging toward a woman and several others in the hotel hallway, and the second-year pro being restrained several times before knocking two people down. Hunt led the NFL in rushing as a rookie with 1,327 yards and eight touchdowns in helping Kansas City make the playoffs. He had run for 824 yards this season, with seven touchdowns rushing and seven more receiving, in helping the Chiefs to a 9-2 start and a lead in the AFC West. He won’t be as a member of the Chiefs. Domestic violence has been a major issue in the NFL in recent years, one that struck home in Kansas City in 2012 when Chiefs linebacker Jovan Belcher killed his girlfriend before killing himself at the team’s practice facility. Belcher was later found to have suffered from CTE. The most memorable incident came in 2014, when a video showed Rice punched and knocked out his then-fiancee in an elevator in an Atlantic City hotel. Rice was originally suspended two games by NFL Commissioner Roger Goodell, who later was heavily criticized for such a light penalty after the video was released. Last year, Cowboys running back Ezekiel Elliott was suspended for six games by Goodell after the league concluded after a yearlong investigation that he had several physical confrontations in the summer of 2016 with his girlfriend at the time. The league has implemented a stronger domestic violence policy, but incidents have continued to make news. Just last weekend, the 49ers cut linebacker Reuben Foster when he was arrested on suspicion of domestic violence — he has since signed with Washington but remains on the NFL’s exempt list. The Chiefs chose him in the third round of last year’s NFL draft, and he was poised to spend the season as the backup before Ware went down with a season-ending knee injury in the preseason. Hunt was thrust into the starting role and fumbled on his very first carry in a game in New England, but bounced back to have one of the best seasons in franchise history. Hunt was off to another good start this season, his rushing yardage putting him fourth in the NFL and his touchdown total trailing only the Rams’ Todd Gurley II and the Saints’ Alvin Kamara. He was also well-liked in the locker room, despite the off-the-field distractions from this past offseason. Hunt had joined quarterback Patrick Mahomes, tight end Travis Kelce and several other Chiefs players in attending Sporting Kansas City’s playoff game on Thursday night.